The Cult of Nostalgia is one of those books that does not grab you at the beginning, which is cluttered with unnecessary details and the introduction of too many characters, but waits until the middle before pulling you in. This is a shame, as many people may not hold out that long for the novel to get interesting. It tells the story of Carly, a self-involved life coach who believes her boyfriend, Simon is on the verge of proposing to her. She works in Simon’s bookshop and while she is covering the counter, looks in the cash register and finds plane tickets to Paris with Mr and Mrs on them. Carly makes a dash to the ceremony and hopes she doesn’t ruin Simon’s surprise but when she arrives Simon is walking up the aisle with another woman. Carly follows them with her boyfriend’s bother, Josh, following them to Paris. As well as running off with another woman, Simon has also stolen Carly’s Great-Uncle’s memoir about 1920s Paris and his collection of short stories. She must get back her great Uncle’s memoir and his collection of short stories. Carly’s story is interwoven with her Great-Uncle’s story from the 1960s when he retires from college life to write his memoir about 1920s Paris. These sections from 1920s Paris show Carly’s Uncle mixing with literary giants such Hemingway, Fitzgerald and Stein. These sections were the most successful parts of the novel and I could have easily read a whole novel based on 1920s and 1960s Paris. At times this sections reminded me of Midnight in Paris. 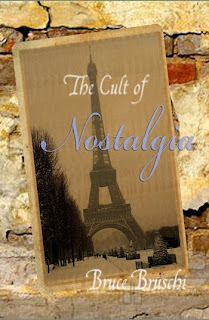 I preferred The Cult of Nostalgia when all of the characters eventually make it to Paris across the different time periods: Carly in 2003, her Great-Uncle in the 1960s and 1920s. Bruschi’s writing comes alive with great descriptions of Paris. The plot starts to progress and becomes intriguing. This book explores the way people deal with self discovery across different time periods. Both Carly and her Great-Uncle must learn to escape their fantasy of the past – Carly must work out what she wants from life in 2003, while in the 1960s, her Great-Uncle must deal with the events from the 1920s so he can finally let go of the past and enjoy the rest of his life. The Cult of Nostalgia explores the ‘cult’ of Paris and how people go there to find themselves. The reader sees how Carly tries to reject Paris and its clichéd meaning but in doing so she discovers what she wants to do with her life. Both characters must move out of the shadow of strong, more domineering characters and create a life on their own terms. The Cult of Nostalgia is a slower burner but it is worth the time.